I have a lot of cookbooks (hmmm probably too many) I love reading them and I really enjoy trying (and of course eating) new recipes. My usual motivation for picking up a recipe book is when I know that we are having guests around for food or I am baking for one of the many college events (there is a lot of cake eating at vicar school so this is a regular occurrence!). Recently I thought I would go through my cookbook shelves and hunt for recipes that are 'everyday meals'. For me this means they are fairly cost effective and quick to put together. Ultimately I want recipes that could become a regular on the Robson table and that after a few tries I could remember the recipe without having to read it step by step. The Philadelphia cookbook and Nigella Express have been brilliant for this as they have loads of simple yet yummy dishes. 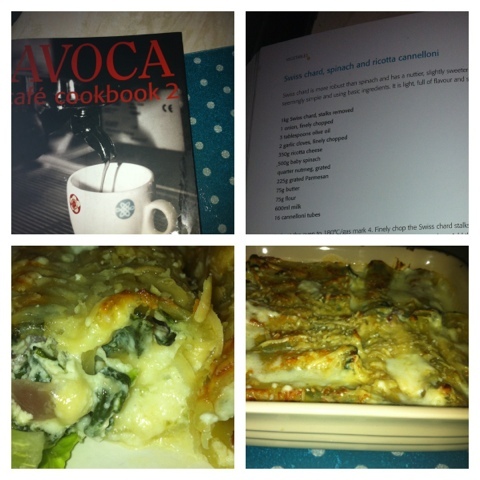 This week I have been looking at the Avoca Cafe Cookbook and tonight I made the Chard, Spinach, Ricotta and Pancetta (my own addition as I have a veggie-phobic husband!) Cannelloni. It was delicious and fairly simple to make. I was really pleased that Martha (now 21months old) also ate the whole portion as its not typical toddler food. We would definitely recommend this recipe and I am looking forward to trying the Avoca cookbook fish cakes tomorrow night. Cambridge Made It Market - Save the date! My top 5 tips to save money without scrimping!